SUEDE – Öland - Swedish archaeologists have uncovered what appears to be a 5th-century murder mystery at an island fort that's being compared to Italy's Pompeii ruins. "It's more of a frozen moment than you normally see in archaeology," said Helene Wilhelmson, a researcher who specializes in the study of bones at Sweden's Lund University. "It's like Pompeii: Something terrible happened, and everything just stopped." Five bodies already have been unearthed amid the ruins of one of the settlement's houses on the island of Öland, just off the Swedish coast. 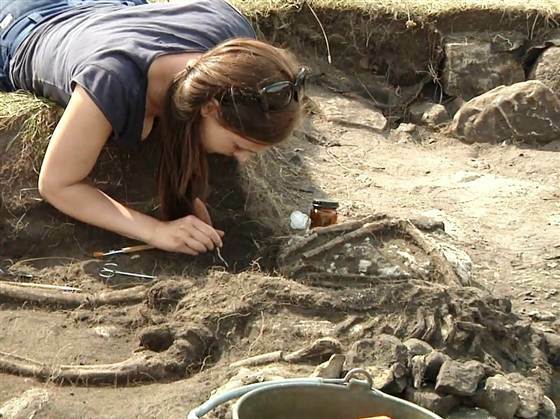 In a news release, Lund University said more human bones have been identified in other parts of the fort, suggesting there may be scores or hundreds of bodies yet to be dug out. "There are so many bodies, it must have been a very violent and well-organized raid," Wilhelmson said. She and her colleagues say the scene dates to what's known as the Migration Period, when tribes moved out from Scandinavia and other areas of northern Europe to confront a Roman Empire in decline. During this era, it was customary for Scandinavians to burn their dead, and very few uncremated remains have previously been recovered, the university said. Was no one left to light the funeral pyre on Öland? Another puzzling fact is that archaeologists found gilded brooches that hadn't been plundered by the attackers — and were still buried at the site 1,500 years later. Wilhelmson wonders whether the site became taboo. "I don't think anyone dared to go near it for a very long time," she said. Lund University archaeologist Nicolo Dell'Unto is creating computerized 3-D models of the ruined fort to reconstruct the crime scene — and perhaps solve the mystery surrounding the massacre. "Using 3-D modeling gives us the unprecedented opportunity to see all the bodies simultaneously, even though the skeletons were removed one by one," Dell'Unto said. ROYAUME UNI – Bamburgh beach - A partially exposed shipwreck on Bamburgh beach offers an unparalleled opportunity for study, say archaeologists investigating it. Working with local archaeologists and volunteers, the Maritime Archaeology Sea Trust (MAST) have conducted a complete site survey. The site lies in the intertidal zone and only appears roughly one hour either side of low-water slack. The site itself sits within its own scour which, along with the tidal conditions, means that it may never completely dry out. The wreck appears to contain the exposed remains of the port side of a wooden sailing vessel lying on its starboard side with its stern inshore. The survival and position of some of the features within the wreck would suggest that the buried structure could be mostly intact as the position of hull structure, deck beams, masts and even deck fittings are all as would be expected. An initial report by MAST states: “Should the starboard side survive under the sand it would potentially offer an unparalleled opportunity to study a wreck with this level of survival within the intertidal zone, there being very few comparable examples currently discovered above the low-water line within the UK. “The exposed deck beams suggest the possible survival of decks below the sand (possibly the entire starboard side) which would also be extremely rare within the UK.” The survival of the lower parts of the mast from just above the main deck and possibly down to the mast step would also offer a rare opportunity to study these features. 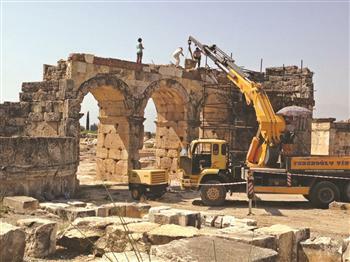 TURQUIE – Hierapolis - Excavations are continuing in the western province of Denizli’s ancient city of Hierapolis in an effort to restore the 1,800-year-old ancient theater of Hierapolis. According to a written statement from the ministry, the ancient theater, which is unique with its collection of mythological reliefs and its stage structure, will be converted into an area thriving with cultural and art events, along with an expected seating capacity of 12,000 after the restoration is completed. Hierapolis, which is located in the central district of Denizli and takes its name from the goddess of the Amazons, Hiera, is one of the most visited destinations in Anatolia thanks to its pagan sites, a historic bath, walls, water channels and churches. Works in the ancient city have been continuing for many years under the management of Professor Francesco D’Andria from Italy’s Salento University.